Today’s dessert is Hot Chocolate Fudge Cake from the most recent issue of Cooking Light. What’s special about this one is it’s a lightened up version of a classic make-ahead dessert that every chocolate lover will appreciate – -and this time of year that’s a real plus, because hosts have enough other aspects of the meal to worry about. And Hot Chocolate Fudge Cake, if well executed, never disappoints. It’s served hot so guests fall under the illusion that you went to a lot of trouble when really, all you did was slip away from the dinner table for 2 minutes to slip a tray of these into the oven and start the coffee. And do these taste light? Well, they were ranked very high by the editors of CL and I can tell you that the ones I made tasted as good as you’d get in a restaurant. The secret is to measure your flour properly not to skimp on the good cocoa and chocolate. Use the best you can afford – and you’ll be able to afford the good stuff because the recipe only calls for a small amount. A little goes a long way. Speaking of little. If you don’t have 4 oz ramekins, you can find them at most kitchen stores. I bought mine at a store here in Austin called Faraday’s. The 4 oz ramekins look tiny, but when you fill them with batter and actually bake up the little cakes, you’ll be satisfied with their size. And one last thing, I didn’t bother with the 1 cup of egg substitute. It only cuts 20 calories off each dessert and eggs are cheaper and more convenient. I used 4 large eggs and would do it again that way. If you’re worried about egg safety, you could buy pasteurized eggs. So all in all I’d say these were seriously good and I’ll be making them again soon. Now that looks VERY nice indeed! You gotta love anything that chocolate oozes out of! The note is for people concerned about eating things with undercooked eggs. If you’re not concerned, don’t worry about it. I’m pretty sure the center gets hot enough (160 degrees F) to kill the salmonella, but I’ve never stuck a thermometer in the center to test. You can’t be too careful when it comes to salmonella. I don’t understand why you say “If you’re worried about egg safety, you could buy pasteurized eggs.” The recipe is bakes at 350 for over 20 minutes, so there are no raw eggs to worry about. Am I missing something? Carol, I think they’d be fine without it. I want to make these for a dinner party but do not like coffee and some of the guests don’t drink it. Can I leave out the espresso powder and still have a good result ? Thanks. It sounds to me like either you accidentlly used too much flour (easy to do if you don’t have a scale!) or over-cooked them. Has your oven been running a little hot? But back to the flour, unless you weigh it or *very* carefully spoon and level without shaking the cup, it’s easy to use too much. Wish I was there to troubleshoot with you. It’s probably one little thing that’s messing everything up. I tried these today and my centers did not come out molten – just cake-like. Delicious, but not at all gooey in the center. I followed the recipe to the letter. What could have gone wrong? Onew of these days I’ll try the chocolate decadence. I also made this recipe using real eggs. My husband and I thought they were fantastic– crusty top, gooey middle, and rich chocolate taste. We did not bake the entire recipe at once; just kept the batter in the refrigerator and baked on a need-to-eat basis. The Cooking Light Chocolate Decadence is also really delicious but the serving size is smaller, calories are higher, and the preparation is fussier. Have you made the Chocolate Decadence from Cooking Light? How do these compared. My family loves those but I would like to try this new recipe. I really wanted to make these when I got my issue but there’s only 2 of us and I don’t feel like they’d reheat very good and for some reason (I can’t remember now) I thought they would be hard to cut in half or smaller. I’ll just have to have a few friends over! these remind me of molten lava cakes. they look amazing!!! are they nice and chocolately in the center? i sure hope so. Mmm.. thanks for this review! On impulse I picked up the latest Cooking Light at the grocery store on Monday (yes, seeing the lovely hot chocolate fudge cakes on the cover). I’m glad to know that they’re good! I will have to try them at my next dinner party and, as you suggested, slip away to pop them in the oven! I printed it to try, but I’m curious how the granulated sugar works out. My favorite “molten lava cake” recipe uses powdered sugar instead… and I was out once and tried granulated sugar, it just wasn’t the same (texture wise). I omit the cloves and just do a pinch of cinnamon and ginger. I also use mexican vanilla and add 1.5 tsp. Yes, there was enough batter for 10. Maybe the reviewer filed hers a bit too high? These remind me of the lava cakes that Cactus Club serves! yummmmy! The reviews on the website said that the recipe really only made enough for 7 ramekins, which makes them a lot less light…did you get enough for the full 10 ramekins? Wow, that does look great! 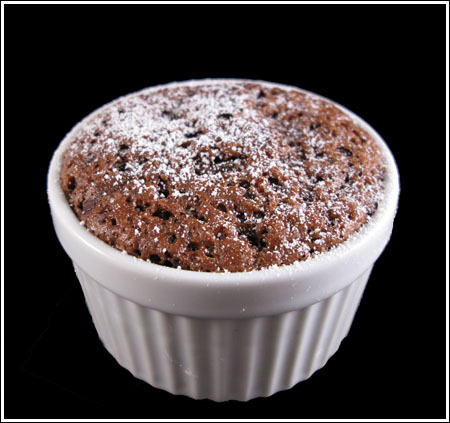 I love another cooking light ramekin requiring recipe, for chocolate souffle’s, so good! This chocolate dessert looks absolutely heavenly! Great job! wow, that is making me want chocolate!! looks sooo delicious!